Recipe and photograph furnished by Virginia Willis, Cookbook Author,www.virginiawillis.com. Combine the water, salt and brown sugar in a large plastic container and stir to dissolve. Add the chicken; cover and refrigerate to marinate for 4 to 6 hours. Prepare a charcoal fire using about 6 pounds of charcoal and burn until the coals are completely covered with a thin coating of light gray ash, 20 to 30 minutes. Spread the coals evenly over the grill bottom, position the grill rack above the coals and heat until medium-hot. For a gas grill, turn on all burners to high; close the lid and heat until very hot, 10 to 15 minutes. Meanwhile, remove the chicken from the marinade and rinse under cool running water. Pat dry with paper towels, season with pepper and set aside. Apply some oil to the grill grate. Place the chicken on the grill, leaving plenty of space between each piece. Grill until seared, about 1 to 2 minutes per side for legs and thighs and 3 or so minutes for breasts. Move the chicken to medium-low heat or reduce the heat to medium; continue to grill turning occasionally, until the juices run clear when pierced, 12 to 18 minutes. 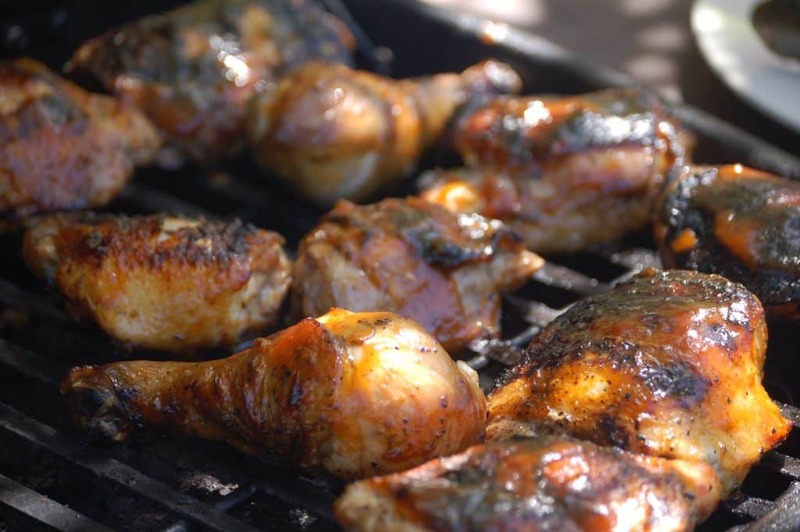 During the last 5 to 7 minutes of cooking, brush the chicken with barbecue sauce. Remove the pieces from the grill as they cook and transfer to a warm platter. Give them a final brush of sauce for flavor and serve immediately with additional sauce on the side.